Hello again! Here’s the solutions to the Ortus Sanitatis Quiz. How did you do? Judging by the responses, not too many people were eager to hazard a guess, but that’s fine, here’s where you get to see that you were right all along. First up is one of the dreaded gold-digging ants. You’d think they’d know by then what ants look like, but their large size seems to have discombobulated many contemporary authors into depicting them as vertebrates of some sort. Another animal that a lot of bestiaries got confused about was the chameleon. If you’ve never seen a chameleon before – hell, if you’ve never seen a lizard before – it’s probably hard to picture it. Some figured that, going by its name, it’s some sort of camel-lion hybrid. Or a griffinesque thing, who knows? Chameleons are weird. This one’s easier. The spots and fragrant breath identify it as a panther. And the fire wreathing this piglike thing clearly sets it apart as a salamander. “What’s a scorpion like? It’s got… a sting on its tail right? But what’s the rest like? Eh, who cares”. … this one’s also a nightjar! Trick question, I included two goatsuckers. This one shows it in the actual act of feeding on a nonplussed goat. This one’s easy. Stag beetle! Or Vikavolt, who knows. And those aren’t giant birds, they’re cranes fighting a pygmy. The lagopus, “rabbit foot”, is more commonly called the ptarmigan today. But the authors figured that a rabbit-footed bird probably had more rabbit to it than that. This one’s tricky. It’s an opimachus, or “snake fighter”. The term originally referred to a type of insect, but here I think there was some confusion with the secretary bird. Is this the origin of the opinicus? I do believe so! Insects going in and out of a fire? Pyrallis, obviously. An ostrich is a struthiocamelus. That means it’s part camel, right? A camel-bird. Yeah. A camel-bird. With wings. That can’t fly. Something tells me the artist never saw a dolphin before. Or an octopus. See, the ancient Greeks (for instance) knew what a polypus looked like because they fished it up and ate it. 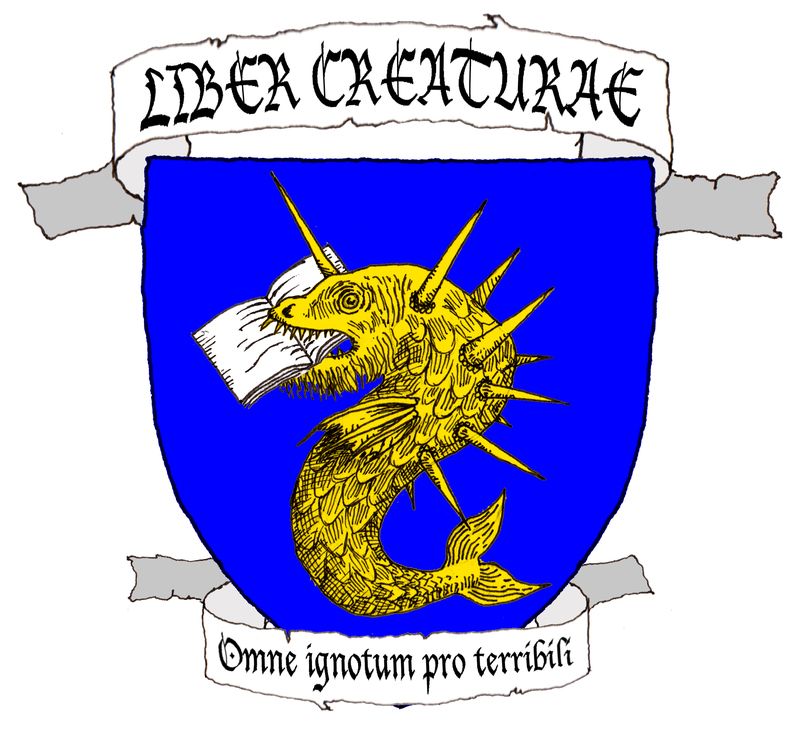 But get yourself a landlocked medieval European and tell them that there’s a sea creature with eight legs… well, it’s a fish right? And finally, everyone’s favorite river-horse, the hippopotamus. Someone took the horse part a bit too literally. How did you do? Give yourself a pat on the back if you knew at least half of them! I’m going to give a pat on the back to myself to comfort myself from crying. Hahaha, I looove this entry! No, really, I LOVE this. Sorry, I can’t English, apparently hahaha. posted January 12, 2018 at 12:20 AM by abookofcreatures in reply to S.
I go away for a few weeks and I of course miss a bestiary quiz! Sorry for the low attendance of the contest, I was distracted by the endlessly miserable slog of work randomly interrupted by old episodes of Highlander. I would actually love to see any media use medieval woodcuts as inspiration. Closest I can think of is Ars Magica.